The Republican Party for years attempted to establish themselves as advocates for a small government and a free market. The current stimulus bill, pushed heavily by President Obama, exemplifies the exact nature of what Republicans need to stand up against if they are to re-establish themselves as fiscal conservatives. The Bush administration passed a massive stimulus bill and it was heavily criticized by conservative talk show hosts including Rush Limbaugh and Sean Hannity. President Bush's bill put money into the economy immediately and banks quickly received money in order for them to continue lending. It is still not clear whether or not the bill was effective. The difference between President Bush's bill and the one that President Obama proposed is that President Obama had ample time to get it right. President Obama claimed to have been working on a solution for the economy since before he was even elected, and this is what he came up with? Minutes after his Secretary of the Treasury announced the specifics of the Obama plan the stock market responded by plunging dramatically. President Obama promised a new era of transparency and proclaimed that a copy of the stimulus bill would be available online for the public to read before Congress voted on it. This did not happen. 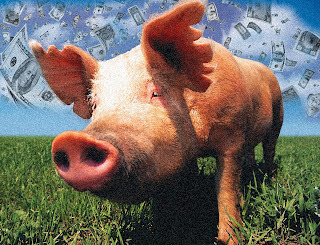 The bill is full of pork and pet projects for the Democrats. The Republicans were given very little say in the bill and this bill was not bi-partisan. The bill contains measures that will not put money into the economy for another 3-4 year. We need money in the economy now. The jobs that it will create will only be temporary and the average citizen who has recently lost a job will likely not want to take these jobs. I agree that something must be done to help the economy, but it has to be a good plan, lets get it right. Not a single House Republican voted for the bill, and only three Republican Senators voted for it. This is the first step in the Republicans re-establishing themselves as fiscal conservatives, and it's about time. the difference between bush's and obama's plans? bush gave hundreds of billions to banks who horded it away for their incredibly well-paid though failed execs, lending none to the public who needed the credit--the presumed recipients... a little like trickle down reality, doncha think? obama is giving hundreds of billions to infra-structure building, firemen, law enforcement, education, green jobs, and not a dime to acorn by the way (which i'm sure your radio heroes have told you). pork you say? lots of folks are tossing that word around but i haven't heard a single one specify what it is they consider pork in this bill... how bout you do it--that is, after you've read it, rather than assuming your guys are being fair minded when they regurgitate that rhetoric. green jobs are not temporary by the way... they are the stuff of the future. 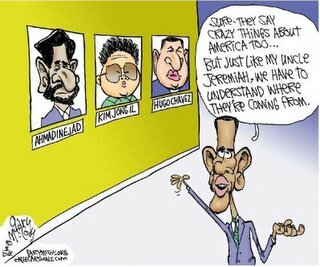 and, they can't be outsourced to the 3rd world labor. and roads don't get built by a bunch of unorganized day-laborers either... there are contractors, designers, accountants, suppliers, foremen, masons, all the little delis they get their lunch from, etc... all those people are [often small] business owners and operators. we're not contracting mexican illegals here. and quite frankly, the average american will take any damn job they can get right now... or haven't your friends in radio been reporting unemployment numbers and business closures at all. Nathan, Can you comment on the position the California Republican governor is taking on the issue of stimulus money and whether to take it or refuse it. This is again an internal issue for Republicans regarding stances that refuse cooperation with the stimulus package (Jindal's position) in order to show independence and their mandate to help their states recover (Schwarzenegger's position). The URL is from the Huffington post--but it has embedded in it the video of Gov. Arnold Schwarzenegger--and that's the text I'm pointing to, not what the Post says, necessarily. 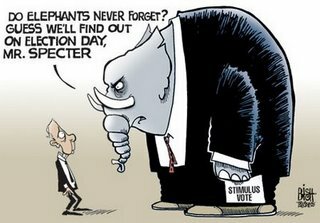 The Republicans had little input in the stimulis package because they didn't want any part in it. Its better to take action then no action at all. Why didn't the republicans want to participat in this bill? What is the GOP doing to ensure the American people that they are working for us and not just working against Obama? It seems like they are taking an interest in themselves instead of in the people.